Canadian palaeontologists Brandon Thackery and Miles Jordan are the world's first time travellers. They are sent back in time 65 million years to the late Mesozoic in an effort to determine what caused the extinction of the dinosaurs. Travelling aboard "His Majesty's Canadian Timeship Charles Hazelius Sternberg", affectionately known as the Sternberger, the pair embarks on a whirlwind adventure as they discover the dinosaurs are more alien and intelligent than previously imagined. End of an Era reads as a fun novel filled with tongue-in-cheek jabs at conspiracy theories, the Canadian government and time travel genre in general. The novel represents Rob Sawyer's first full length story that was only published in the mid-90s after his Far Seer series was successful. The time travel in this novel is driven by the "Huang Effect" which essentially casts an object back in time and after a given duration the object is returned to the present. Sawyer is also careful to set a limitation to the time travel device by stating that the power required to send an object back in time is inverse to the amount of time displaced. In other words, the energy requirements to cast an object back to the late Mesozoic are relatively nothing, but sending an object back within the span of our own lifetime is virtually impossible. This external constraint allows Sawyer to focus his story on the time period he wants without the reader begging the question, why late Mesozoic and not Dallas on November 21, 1963? While much science fiction simply employs time travel as a simple plot device to transport characters to interesting historical periods, a well written time travel story such as End of an Era goes beyond that to look at the nature of time itself. As the novel progresses Brandon living in the present discovers that his personal diary is filled with entries from the time-travelling Brandon with references to events that have never happened in his own timeline, such as his own divorce. Sawyer manages to suggest through this cross-over that other forces may be at work to eliminate the possibility of time-travel. 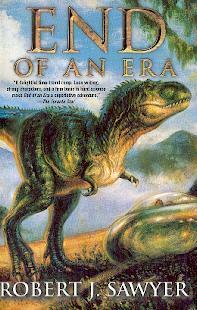 The action in the novel is well written and to Sawyer's credit manages to keep the reader from looking to far ahead and figuring out what ultimately did cause the extinction of the dinosaurs until he is prepared to reveal it. I eagerly recommend End of An Era to anyone with an affinity for time travel, dinosaurs, Martians, or Rob Sawyer's writing in general.